A new study suggests mysterious X-ray flares caught by Chandra may be asteroids falling into the Milky Way's giant black hole. These flares have been seen during periodic observations over several years and happen about once every day. If confirmed, this result may mean that there is a cloud around the black hole containing hundreds of trillions of asteroids and comets. A new study provides a possible explanation for the mysterious flares. The suggestion is that there is a cloud around Sgr A* containing hundreds of trillions of asteroids and comets, which have been stripped from their parent stars. The panel on the left is an image containing nearly a million seconds of Chandra observing of the region around the black hole, with red representing low-energy X-rays, green as medium-energy X-rays, and blue being the highest. An asteroid that undergoes a close encounter with another object, such as a star or planet, can be thrown into an orbit headed towards Sgr A*, as seen in a series of artist's illustrations beginning with the top-right panel. 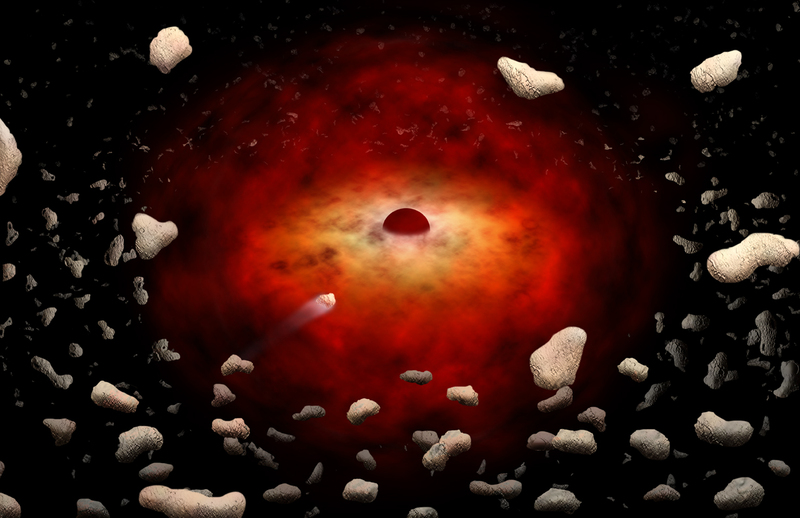 If the asteroid passes within about 100 million miles of the black hole, roughly the distance between the Earth and the Sun, it would be torn into pieces by the tidal forces from the black hole (middle-right panel). These fragments would then be vaporized by friction as they pass through the hot, thin gas flowing onto Sgr A*, similar to a meteor heating up and glowing as it falls through Earth's atmosphere. 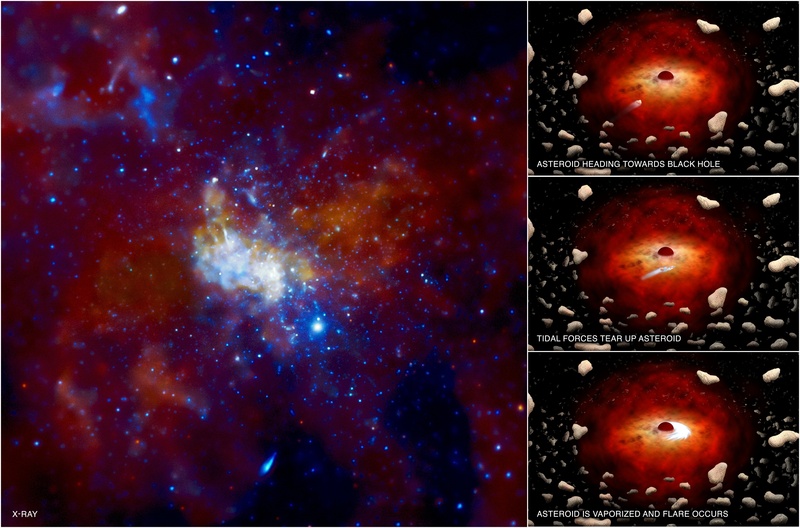 A flare is produced (bottom-right panel) and eventually the remains of the asteroid are swallowed by the black hole. Very long observations of Sgr A* will be made with Chandra later in 2012 that will give valuable new information about the frequency and brightness of flares and should help to test the model proposed here to explain them. This work has the potential to understand the ability of asteroids and planets to form in the harsh environment of Sgr A*. Thanks very much for your comment. I am aware that the work of Kostic et al. is referenced by Zubovas et al. I will email you with some suggestions for further recognition of the work by Kostic et al. There will be material - mainly hot gas - around the outside of the event horizon. This will eventually pass over the event horizon, never to be seen again, unless some process like a wind or a jet ejects it. I do not believe that secret passages (like wormholes) are generally being invoked by researchers to understand material falling onto black holes. Thankfully, the Earth is not being drawn towards Sgr A*. There are *much* stronger sources of gravity, such as the Sun and the Moon. It's believed that black holes can radiate in a process called Hawking radiation, although this is believed to take an extremely long time for astrophysical black holes. Good comment - the authors estimate that about 10% of the rest mass of the asteroid will be converted into energy, although all of this might not go into X-rays. All is not lost. Even if we have not observed any, Black holes can dissipate on their own. Some tornadoes don't reach ground, they just disappear on their own into the atmosphere. How quickly are we (earth) being drawn toward sag A? Can we estimate how long it will take us to be drawn into it? Will the circumference of the black hole have "the dust which is not absorbed in the center" around? Or is there "a secret passage" in a law of the physics? Still mystery many "black holes"
NASA expects discovery to surprise people of the world from now on. This scenario was discussed already by Dr. Uros Kostic (Faculty of Mathematics and Physics, University of Ljubljana,)in his PhD Thesis, and published in A&A in 2008-2009. As far as I know, this is the FIRST suggestion that SgrA* flares might be due to accretion and tidal disruption of asteroids and comets.